THESE ARE TWO FABULOUS OLD VINTAGE SALVAGED ARCHITECTURAL WOOD SHUTTERS WITH THE OLD WHITE AND SOFT GREEN PAINT THAT IS CHIPPY, PEELY AND WITH A PERFECT PATINA! These are all wood. They are a nice small size with a great look. The patina on these are incredible! They have the original old white with soft green paint that are chippy, with paint loss, flaking paint and wear for a great look. There is a little hole on one, as I show. A perfect way to add a touch of architectural interest to your room. Great in any shabby chic, Victorian, Antique, romantic cottage or French country home. Measurements are about 24" tall by 9" wide each. They weigh about 3 pounds total. THESE ARE A PAIR OF AWESOME OLD WOOD ARCHITECTURAL CORBELS WITH THE ORIGINAL OLD CHIPPY PINK PAINT AND GREAT PATINA. The old architectural pieces like this add an awesome look to any decor. These are older wood salvaged corbels with a nice design. They have the old pink paint that is chippy, crackly, with paint loss, with some old dirt, some old cracks and time worn for a great patina. These came out of an old house in New Orleans. There are a couple pieces of chipped or missing wood, as I show. Perfect to add a touch of architectural interest to your shabby chic, Jeanne d'Arc, French country, Farm House style or romantic cottage home. Measurements are about 19 1/2" by 20" by 5 1/2" Together they weigh about 11 pounds. PLEASE ADD ME TO YOUR FAVORITES AND CHECK BACK OFTEN. PLEASE SCROLL ALL THE WAY DOWN TO SEE ALL THE PHOTOS. THIS IS AMAZING! IT IS AN OLD SALVAGED ARCHTECTURAL HEADER OR PEDIMENT WITH THE OLD WHITE AND CREAMY BUTTER PAINT AND PERFECT PATINA. This is one of my favorite headers! The old architectural pieces like this add an awesome look to any decor. This is an older salvaged wood piece that is a little over 3 feet long, yet only 11" tall. It has a great design plus little details at the ends in the design. It has the original old white and creamy tan or butter paint that is chippy, crackly, with paint loss, with some old dirt and time worn for a great patina. There are some old cracks, but it is solid. My husband added a hanger for you. It is 5" deep at the top, so you could use this as a wall shelf for some narrow items. Perfect to add a touch of architectural interest to your shabby chic, Jeanne d'Arc, French country, Farm House style or romantic cottage home. Measurements are about 37" long by 11" tall by 5" deep at the top. It weighs about 11 pounds. THESE ARE FABULOUS CORBELS OR BRACKETS. THESE ARE A PAIR OF OLD WOOD ARCHITECTURAL BRACKETS WITH THE OLD CHIPPY WHITE PAINT AND AWESOME DETAILING. The old architectural pieces like this add an awesome look to any decor. These are a perfect size to display just about anywhere in your home. These are older wood salvaged corbels or brackets of good quality with a fabulous design. They have the old white paint that is chippy, crackly, with paint loss, with some old dirt and time worn for a great patina These would be awesome hanging in a doorway, or on a wall. Or perfect to just set out. Perfect to add a touch of architectural interest to your shabby chic, Jeanne d'Arc, French country, Farm House style or romantic cottage home. Measurements are about 12 1/2 " by 18" by 1 1/4" each. Together they weigh 4 pounds. THESE ARE A PAIR OF AWESOME OLD SMALL WOOD ARCHITECTURAL CORBELS WITH THE ORIGINAL CHIPPY WHITE PAINT AND GREAT PATINA. The old architectural pieces like this add an awesome look to any decor. These are older wood salvaged corbels with a nice design in a nice smaller size. The small size corbels like these are so hard to find! They have the original old creamy white paint that is chippy, crackly, with paint loss, with some old dirt, and time worn for a great patina. Perfect to add a touch of architectural interest to your shabby chic, Jeanne d'Arc, French country, Farm House style or romantic cottage home. Measurements are about 7 1/4" by 3 3/4" by 2 1/4" each! THIS IS AMAZING! IT IS AN OLD SALVAGED ARCHTECTURAL GABLE HEADER OR PEDIMENT WITH THE OLD WHITE PAINT AND PERFECT PATINA. The old architectural pieces like this add an awesome look to any decor. This is an older salvaged wood piece that is about 31" long. This is a smaller hard to find peaked gable salvaged piece that is all wood.. It has a great design. It has the original old white paint that is chippy, crackly, with paint loss, with some old dirt and time worn for a great patina. There is some chipped wood, as I show. My husband can add a hanger to the back for you. Perfect to add a touch of architectural interest to your shabby chic, Jeanne d'Arc, French country, Farm House style or romantic cottage home. Measurements are about 31" long by 13" tall by 1 1/2" thick. It weighs about 6 pounds. THESE ARE AMAZING! THEY ARE A PAIR OF 5' TALL WOOD POSTS OR COLUMNS WITH A PERFECT PATINA OF WHITE AND AQUA. Wow, these really are fabulous. They are wood and salvaged porch posts or columns. They have a great shape. They have the old original white and gorgeous aqua paint that is now, chippy, with paint loss, crackly, minor dirt and time worn for the perfect patina. They are free standing, but because they don't have wide bases, they would easily tip over, especially if you have two kitties that love to run and chase each other. These would be perfect to add a touch of architectural interest to your room, and add a little color to an all white room. Measurements are about 59" tall by 3 1/2" by 3 1/2" for each one. Together they weigh about 18 pounds. THIS IS INCREDIBLE! IT IS AN OLD PIECE OF SALVAGED CEILING TIN WITH A GORGEOUS PATTERN AND WITH THE OLD ORIGINAL WHITE PAINT. This salvaged architectural decor piece came off an old ceiling. The pattern is gorgeous with a very ornate design, one of the nicest I have seen on old ceiling tin. It has the old white paint that is a little chippy with minor dirt, paint loss, a little rust and time worn for a nice patina. There are a few minor dings and some old nail holes. A wood frame was made for the back with the edges of the tin wrapped around it. This would be stunning hanging on your wall to add a touch of architectural interest to your room. Perfect anywhere in your home in your shabby chic, French country, Paris Apt or romantic cottage decor. Measurements are about 21 3/4" by 21 3/4". It weighs about 4 pounds. THIS IS AN OLD ARCHITECTURAL FRAGMENT FROM A CHURCH ALTAR WITH A CHIPPY WHITE AND GOLD PATINA AND AWESOME DETAILING. The old vintage architectural pieces like this add an awesome look to any decor. This is a nice smaller size and is an older piece. This fragment was salvaged from an old Church Steeple and is one of the finials. It is so ornate with a fabulous design. It is made of heavy plaster It has the original old white paint with gold highlights that is chippy, crackly, flaked paint, with paint loss, with some old dirt and time worn for a great patina. There are some chips, as I show. The base to make it be free standing was made with a piece of wood that was painted a creamy white. It is not free standing on it's own. Perfect to add a touch of architectural interest to your shabby chic, Jeanne d'Arc, French country, farm house decor or romantic cottage home. Measurements are about 11 1/2" tall without the base, or 14" tall with the base. The fragment itself is about 2 1/2" wide. The base is about 5 1/4" wide and deep. THIS IS FOR THREE OLD WOOD SALVAGED WOOD FINIALS THAT HAVE AWESOME ELEGANT SHAPES. This group of finials have such a great look. These would add a nice architectural touch to any room of your home. They are all wood with the same shapes. They have the old white with touches of gold paint, that is chippy, with paint loss and wear. There are a few minor chips at the bottom, as I show. Perfect anywhere in your home in your shabby chic, Farm House, French country, Paris Apt, Jeannie d Arc Living, or romantic cottage decor. Measurements are 6" tall by 1 1/2" wide each. THIS IS AN OLD SALVAGED ARCHITECTURAL PEDIMENT WITH DOUBLE COLUMNS WITH CAPITALS THAT IS ZINC METAL OVER WOOD. This could easily be a keeper. This is an older formed double columns with capital that is zinc metal. A wood frame was made to attached the metal piece to.. The back is flat with the columns being half columns. At the tops are the fabulous ornate capitals. It has the old white paint that is chippy, with paint loss, a little rust and time worn for a great patina. There is a little separation at the top, as I show. This would be amazing hanging on a wall in your home.. A perfect way to add a touch of architectural interest to your room. Great in any shabby chic, Victorian, Antique, romantic cottage or French country home. Measurements are from about 20" wide by 23" tall and 5 1/2" thick. It weighs about 7 pounds. THIS IS FOR THREE OLD WOOD SALVAGED WOOD FINIALS THAT HAVE AWESOME CHIPPY PATINAS. This group of finials have such a great look. These would add a nice architectural touch to any room of your home. They are all wood with the same shapes. They have the old light green paint, that is chippy, with paint loss and wear. There are a couple old cracks, but they are solid. Perfect anywhere in your home in your shabby chic, Farm House, French country, Paris Apt, Jeannie d Arc Living, or romantic cottage decor. THIS IS AN OLD ARCHITECTURAL FRAGMENT FROM A CAPITAL WITH A CHIPPY WHITE PATINA AND AWESOME DETAILING. The old vintage architectural pieces like this add an awesome look to any decor. This is a nice smaller size. This is just a fragment from an older capital, which was at the top of an old column. It is made of heavy composition or heavy plaster It has the original old white paint with some blue and pink showing thru that is chippy, crackly, flaked paint, with paint loss, with some old dirt and time worn for a great patina. There are some some minor chips. Perfect to add a touch of architectural interest to your shabby chic, Jeanne d'Arc, French country, farm house decor or romantic cottage home. Measurements are about 7" tall by 10" BY 9". It weighs about 6 pounds. THIS IS INCREDIBLE! IT IS AN OLD SALVAGED ARCHTECTURAL HEADER OR PEDIMENT WITH FABULOUS DETAILS AND PERFECT TIME WORN WEATHERED PATINA. The old architectural pieces like this add an awesome look to any decor. This is an older salvaged wood piece that is about 43" long. It is so detailing with an amazing design. It has the old white paint for this great patina that is chippy, crackly, and time worn. It was cut from a larger piece, probably a center porch medallion. There are several repairs, and there are some metal brackets on the back to keep it solid. There are a few pieces of missing wood, as I show in my many close ups. A hanger was added to the back. Don't let this one get away! Perfect to add a touch of architectural interest to your shabby chic, Jeanne d'Arc, French country, Farm House style or romantic cottage home. Measurements are about 43 1/2" long by 14" tall by 1 3/4" thick. It weighs about 10 pounds. HIS IS A VERY ORNATE CAPITAL OR BUILDING MEDALLION WITH THE FACE OF A BEAUTIFUL CHERUB OR ANGEL WITH THE ORIGINAL CHIPPY WHITE PAINT AND AWESOME DETAILING. The old vintage architectural pieces like this add an awesome look to any decor. This is a statement making piece in a nice size. 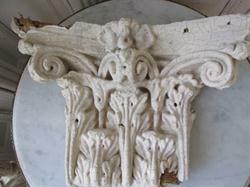 This is an older salvaged capital or half capital of good quality with a fabulous design. It is made of heavy composition or heavy plaster and was salvaged from the front of an old building and was probably the capital on top of a large column. The cherub or angel has a beautiful face and wings , along with other very ornate details. It has the original old white paint that is chippy, crackly, flaked paint, with paint loss, with some old dirt and time worn for a great patina. There are some some minor chips and old hairline cracks, and a little repair to the back inside to keep it solid, as I show, but it is solid. The design is wonderful for a great architectural look and what a statement this will make in your home. There is no hanger on the back. It is NOT free standing. You can lean it, or set it in an urn or planter. Don't let this get away! Perfect to add a touch of architectural interest to your shabby chic, Jeanne d'Arc, French country, farm house decor or romantic cottage home. Measurements are about 13" tall by 14" wide and 6 3/4" deep at the top. It weighs about 12 pounds. THIS IS AMAZING! IT IS AN OLD SALVAGED ARCHTECTURAL ROUND HEADER OR PEDIMENT WITH FABULOUS DETAILS AND PERFECT TIME WORN WEATHERED PATINA. This is one of my favorite pieces! The old architectural pieces like this add an awesome look to any decor. It is so hard to find the round wood architectural pieces like this. And then with the fan like details all around, Wow! There is a flower at the center. This is an older salvaged wood piece It has the old white paint for this great patina that is chippy, crackly, and time worn. There are a few pieces of missing wood and some old cracks, as I show in my many close ups. There are metal braces on the back to keep it solid. It is solid. We can add a hanger to the back. What a statement this would make in your home. Don't let this one get away! Perfect to add a touch of architectural interest to your shabby chic, Jeanne d'Arc, French country, Farm House style or romantic cottage home. THIS IS AN AMAZING OLD ARCHITECTURAL CHURCH LEADED GLASS WINDOW WITH AN ARCHED DESIGN AND GREAT PATTERN. Windows are so easy to decorate with and add a nice vintage architectural feeling to a room. This one is such a nice size and shape. It is an older window with a diamond shape pattern to the window. It was removed from an old Church. There are a few colored glass pieces along the sides, and all the other pieces are clear with a light texture or waviness. There are some flaws and air bubbles to the glass. There is discoloration to the metal lead. There is some unevenness to the outside edges of the metal, as I show. There are a few little pieces of the leaded metal missing, but it is solid. PLEASE NOTE THAT THERE IS A CRACK TO ONE OF THE SMALL PANES, AS I SHOW. There is a little hanger at the top, so you can hang with a nail, or lean against the wall. Perfect for any shabby chic, romantic cottage, Jeanne d'Arc Living, Farm House or French country d�cor. Measurements are about 31" tall by 12 3/4" wide. It weighs about 7 pounds. OMG! THESE ARE INCREDIBLE CORBELS. THESE ARE A PAIR OF OLD WOOD ARCHITECTURAL CORBELS WITH THE ORIGINAL CHIPPY WHITE PAINT AND AWESOME DETAILING. I have had many pairs of these, and this is the last pair available. These are a pair of some of the nicest corbels I have seen! The old architectural pieces like this add an awesome look to any decor. These are a perfect size to display just about anywhere in your home. These are older wood salvaged corbels of good quality with a fabulous design. They have nice chunky 7" tall finials and scallops on each one. They have the original old white paint that is chippy, crackly, with paint loss, with some old dirt and time worn for a great patina. Perfect to add a touch of architectural interest to your shabby chic, Jeanne d'Arc, French country, Farm House style or romantic cottage home. Measurements are about 20 1/2" by 15" by 6 1/2" each. Together they weigh 19 pounds. THIS IS AMAZING! IT IS AN OLD SALVAGED ARCHTECTURAL HEADER OR PEDIMENT WITH AN ARCHED TOP AND PERFECT TIME WORN WEATHERED PATINA. This is one of my favorite headers! The old architectural pieces like this add an awesome look to any decor. This is an older salvaged wood piece that is almost 4 feet long.. It has a great arched top at the center plus nice carved wood details in the design. Most of the paint has worn off perfectly for this great patina that is chippy, crackly, and wear. There are som old cracks, but it is solid. My husband added a hanger for you. Don't let this one get away! Perfect to add a touch of architectural interest to your shabby chic, Jeanne d'Arc, French country, Farm House style or romantic cottage home. Measurements are about 46" long by 11" tall by 3" wide at the top. It weighs about 8pounds. THIS IS AN AWESOME OLD ARCHITECTURAL ROUND WINDOW FRAME WITHIN A SQUARE THAT HAS NINE PANES WITH THE ORIGINAL WHITE PAINT ON THE WOOD FRAME. PLEASE NOTE THAT THIS IS THE WINDOW FRAME ONLY. THERE IS NO GLASS. THE GLASS WAS ALL BROKEN OUT OF IT. Windows are so easy to decorate with and add a nice vintage architectural feeling to a room. This is just amazing! It is an awesome 24" square window with the circle inside. You hardly ever see the sindows with round openings like this one. The wood frame has the original white paint on both sides with crackly paint, paint loss, minor dirt, stains, and time worn for a great look. There are some chipped pieces of wood on the back, as I show. It has the old latch It has nine panes. Remember there is no glass. My husband can add a hanger to this if you will be hanging it. Perfect for any shabby chic, romantic cottage, or French country d�cor. Measurements are about 24" by 24" by 1 1/4". It weighs about 8 pounds. THIS IS AN AWESOME OLD ARCHITECTURAL ARCHED WINDOW FRAME WITH THE ORIGINAL WHITE PAINT ON THE WOOD THAT IS ABOUT 42" TALL. PLEASE NOTE THAT THIS IS THE FRAME ONLY. THERE IS NO GLASS. Windows and window frames are so easy to decorate with and add a nice vintage architectural feeling to a room. This is one of those statement making window frame. The wood frame has the old white paint on both sides, that is a little chippy, crackly, with minor stains, scratches, dirt, with paint loss and time worn for a great look. There are a couple old cracks, but it is very solid. My husband can add a hanger if you will be hanging it. Perfect for any shabby chic, romantic cottage, or French country d�cor. Measurements are about 42 1/2" tall by 15 1/2" wide and 1 1/2" thick. It weighs about 6pounds. THESE ARE A PAIR OF AWESOME OLD WOOD ARCHITECTURAL CORBELS OR BRACKETS WITH THE ORIGINAL CHIPPY WHITE PAINT AND GREAT PATINA. The old architectural pieces like this add an awesome look to any decor. These are older wood salvaged corbels with a very unique design. There are so many ways to display these, as I show. You can also hang them on the wall flat to create an amazing header, as I show. They have the original old white paint that is chippy, crackly, with paint loss, with some old dirt, some old cracks and time worn for a great patina. Don't let these get away! Perfect to add a touch of architectural interest to your shabby chic, Jeanne d'Arc, French country, Farm House style or romantic cottage home. Measurements are about 30" by 28" by 1 1/2" each. Together they weigh about 20 pounds. THIS IS AN OLD SALVAGED ARCHITECTURAL BASE FROM AN OLD COLUMN. This is a very nice base that is square rather than round, which is very hard to find. This is an older wood column base in a nice size. These are awesome to use as a display pedestal for a special item, as I show. It is not exactly square and the back side is a cut side. It has the old white paint that is chippy, crackly with paint loss, minor dirt and wear. There are some old cracks, but it is solid. There is a little piece of chipped wood, as I show. A perfect way to add a touch of architectural interest to your room. Great in any shabby chic, Victorian, Antique, romantic cottage or French country home. Measurements are from about 11 1/2" by 12 1/2 by 6" tall. The top display area is about 7 3/4". It weighs about 8 pounds. THESE ARE AN AMAZING PAIR OF LARGE OLD WOOD ARCHITECTURAL CORBELS WITH THE OLD CHIPPY WHITE PAINT AND GREAT PATINA. Wow! What a statement these will make in your home! I have a large pair just sitting in our family room floor and love them there. The old architectural pieces like this add an awesome look to any decor. These are older wood salvaged corbels with a nice design. They have finials, scallops, cut outs, medallions, just incredible! They have the original old white paint that is chippy, crackly, with paint loss, with some old dirt, some old cracks, as I show, a little chipped wood, as I show and time worn for a great patina. There is a little movement to one of the finials, but it appears solid. I think there were given a coat of sealer to maintain the chippy patina without flaking. There are so many ways to display these. Perfect to add a touch of architectural interest to your shabby chic, Jeanne d'Arc, French country, Farm House style or romantic cottage home. Measurements are about 30" by 17 1/2" by 5 1/2" . They weigh 17 pounds each. THIS IS AN OLD VINTAGE ARCHITECTURAL TIN METAL PANEL OR FLAT COLUMN OR DECOR PIECE WITH ORNATE DETAILS THAT WOULD MAKE AMAZING WALL DECOR. . I'm not sure what this was salvaged from. It is all metal or tin that is like embossed metal. It is not very heavy. It has the most ornate awesome design and pattern with 4 large flowers . It has the original white paint with paint loss, a little rust and wear for a great patina. It was cut from something and some other pieces were cut out, so there are a few uneven edges and sharp edges. You can display horizontally or vertically, as I show. This would be fabulous and add a touch of architectural interest in any shabby chic, Farm House, Jeanne d Arc Living,romantic cottage or French Country home. Measurements are about 32" by 8". THIS IS AN AWESOME OLD VINTAGE SALVAGED ARCHITECTURAL ZINC METAL HEADER OR TRIM PIECE WITH A FABULOUS DESIGN I love this! It is a piece of salvaged old metal zinc with an amazing design that is about 30 3/4" long. It is an older piece with nice deep indentations. it has the original gray finish with a little rust, discoloration and wear for a great patina. There are a couple minor breaks to the metal, a couple little holes and some minor dings, as I show. A perfect way to add a touch of architectural interest to your room. Great in any shabby chic, Victorian, Antique, romantic cottage, Farm House, or French country home. Measurements are about 30 3/4" wide by 7 1/2" tall. HIS IS AN AWESOME OLD ARCHITECTURAL WINDOW THAT IS TRIANGLE SHAPED WITH THE ORIGINAL WHITE PAINT ON THE WOOD FRAME. Windows are so easy to decorate with and add a nice vintage architectural feeling to a room. The wood frame has the original white paint on both sides with crackly paint, paint loss, some uneven paint and time worn for a great look. There is one single glass pane with a triangle or peak design. My husband can add a hanger if you will be hanging it. Perfect for any shabby chic, romantic cottage, or French country d�cor. Measurements are about 26 1/2" long at the bottom, by 13" tall at the peak and 1 1/2" thick. It weighs about 3 pounds. THIS IS A SMALL OLD VINTAGE SALVAGED ARCHITECTURAL ZINC METAL WREATH ON WOOD WITH THE OLD PAINT. This is a nice small size. It is a piece of salvaged old metal zinc with a stunning wreath that was wrapped and nailed. The wreath is nice and thick. It has the wonderful old grayish blue paint, that is chippy, with paint loss, crusty, and wear for an awesome time worn patina. My husband can add a hanger if you want. A perfect way to add a touch of architectural interest to your room. Great in any shabby chic, Victorian, Antique, romantic cottage, Farm House, or French country home. Measurements are from about 12" wide by 9 1/2" and 1" thick. It weighs about 2 pounds. HIS IS FABULOUS ! IT IS AN OLD SALVAGED ARCHTECTURAL HEADER OR PEDIMENT WITH THE OLD LIGHT GREEN PAINT AND PERFECT PATINA. This is an older salvaged wood piece that is 30" longl. It has a great curved shape with different depths or tiers. It has the original old light green paint that is chippy, crackly, with paint loss, with some old dirt and time worn for a great patina. My husband can add a hanger for you. Don't let this one get away! Perfect to add a touch of architectural interest to your shabby chic, Jeanne d'Arc, French country, Farm House style or romantic cottage home. Measurements are about 30" long. It is about 10" wide with the curve. The wood itself is about 6 1/2" wide. it weighs about 4 pounds. THIS IS THE BEST OLD VINTAGE ARCHITECTURAL SALVAGED PIECE THAT IS CAST IRON WITH ORNATE DETAILS THAT WOULD MAKE AMAZING WALL DECOR. This is nice and thick and has very ornate curvy detailing. It is an older well made piece. I'm not sure what this was salvaged from, but I think perhaps an older Church fencing. The original paint is mostly worn off, and it now has an awesome crusty, rusty time worn patina. It is not free standing. You can see where it was cut from a larger piece at the bottom. These would be fabulous and add a touch of architectural interest in any shabby chic, Farm House, Jeanne d Arc Living,romantic cottage or French Country home. Measurements are about 26 1/2" tall by 11 1/2" wide. It weighs about 12 pounds. THIS IS THE BEST OLD VINTAGE SALVAGED ARCHITECTURAL ZINC METAL HEADER OR PEDIMENT WITH A GARLAND OR SWAG WITH FLOWERS AND BOWS ON WOOD WITH THE OLD WHITE PAINT. I love this! It is a piece of salvaged old metal zinc with a stunning garland or swag with large bows and flowers that was wrapped and nailed to a wood back. The swag is nice and thick. It has the wonderful old white paint, that is chippy, with paint loss, crusty, and wear for an awesome time worn patina. My husband can add a hanger. A perfect way to add a touch of architectural interest to your room. Great in any shabby chic, Victorian, Antique, romantic cottage, Farm House, or French country home. Measurements are from about 20" long by 10 1/2" tall" and 1" thick. It weighs about 4 pounds. THIS IS THE BEST OLD VINTAGE SALVAGED ARCHITECTURAL ZINC METAL HEADER OR TRIM PIECE WITH A FABULOUS DESIGN I love this! It is a piece of salvaged old metal zinc with an amazing design that is about 30 1/2" long. You can decide if you prefer this with the scalloped peaks up or down. It is an older piece with nice deep indentations. it has the original gray finish with a little rust, discoloration and wear for a great patina. There are a couple minor breaks to the metal and some minor dings, as I show. A perfect way to add a touch of architectural interest to your room. Great in any shabby chic, Victorian, Antique, romantic cottage, Farm House, or French country home. Measurements are about 30 1/2" wide by 7 1/2" tall. THIS IS AN OLD SALVAGED ARCHITECTURAL BASE FROM AN OLD COLUMN WITH THE ORIGINAL OLD WHITE PAINT. THE WOOD DUCK AND DOLL BODY WITH CROWN ARE NOT INCLUDED BUT FOR SALE ON OTHER EBAY AUCITONS TONIGHT. This is a very nice base with three layers. This is an older wood column base in a larger size. These are awesome to use as a display pedestal for a special item, as I show. It has the original white paint except on the bare wood where the original column was. you could put white paint on it, if you wanted to, or leave it as is. This is an older piece with three levels, which is hard to fine, the square bottom, and two round ones. It is chippy, with paint loss, peely paint, old dirt, stains and time worn for a great patina. There are a few sharp points at the top from where the nails were cut off. A perfect way to add a touch of architectural interest to your room. Great in any shabby chic, Victorian, Antique, romantic cottage or French country home. Measurements are from about 10 1/4" by 10 1/4" by 4" tall. The top for display is about 6 1/2" wide. It weighs about 6 pounds. OMG Old ARCHITECTURAL WHITE CEILING TIN 4 WINGED CHERUBS ANGELS 24"
THIS IS INCREDIBLE . IT IS AN OLD PIECE OF SALVAGED CEILING TIN WITH A GORGEOUS ORNATE PATTERN AND FOUR ANGELS OR CHERUBS WITH WINGS AND THE OLD ORIGINAL WHITE PAINT. This salvaged architectural decor piece came off an old ceiling and is about 24" by 24". The pattern is gorgeous and so ornate with 4 precious cherubs or angels with wings in the corners. You can hang it square or at an angle. It has the old white paint that is a little chippy with minor dirt, paint loss, a little rust and time worn for a nice patina. There are some old nail holes. This would be stunning hanging on your wall to add a touch of architectural interest to your room. Perfect anywhere in your home in your shabby chic, French country, Paris Apt, Farm house, or romantic cottage decor. Measurements are about 24 1/4" by 24 1/4". THESE ARE TWO FABULOUS PAIR OF OLD VINTAGE SALVAGED ARCHITECTURAL DOUBLE SHUTTERS OR SHUTTER PANELS WITH THE OLD TIME WORN WHITE PAINT THAT IS CHIPPY, PEELY AND WITH A PERFECT PATINA! These are older and all wood. Each shutter is a double shutter that are connected with hinges at the center with one shutter and one panel door on each one. They are wood. Not all the louvered shutters open and close. You can display them flat on the wall, or adjust them at a slight angle as I show to make them free standing. It has the original old white paint that are chippy, with paint loss, flaking paint and wear for a great look. A perfect way to add a touch of architectural interest to your room. Great in any shabby chic, Victorian, Antique, romantic cottage or French country home. Measurements are about 38 3/4" tall by 15 1/4" wide each when flat.. They weigh about 14 pounds total. THIS IS AN WONDERFUL ARCHITECTURAL HEADER OR PEDIMENT WITH A HINT OF PINK IN THE COLORING AND CHIPPY PATINA. This is wood and is a salvaged door header. It is about 48" long. It has a nice simple design with some beading in the design. It has a very soft pink paint that is chippy, peely, c and time worn for a great patina. There is a small piece of chipped wood at the top and some minor old cracks, as I show. This would add a nice architectural touch to any room of your home. We added a hanger to the back. Perfect anywhere in your home in your shabby chic, Farm House, French country, Paris Apt, Jeannie d Arc Living, or romantic cottage decor. Measurements are about 48" long by about 8" tall and it weighs about 8 pounds. WHAT A FABULOUOS PIECE OF SALVAGED CEILING TIN WITH THE FACE OF A CHERUB OR ANGEL AND WITH PATINA. This is an old piece of salvaged ceiling tin that came out of an older home. It has an incredible thick formed pattern with a cherub of angel and other ornate details. It has a great design and is silver or gray that is chippy with scrapes, paint loss a little rust and wear for a great patina. There are some minor dings, and a couple little cuts on the edges. There are the old nail holes to hang it from. Measurements are about 22 1/2" by 22 3/4". It weighs about 2 pounds. THESE ARE FABULOUS CORBELS OR BRACKETS. THESE ARE A PAIR OF OLD WOOD ARCHITECTURAL BRACKETS WITH THE ORIGINAL CHIPPY WHITE PAINT AND AWESOME DETAILING. The old architectural pieces like this add an awesome look to any decor. These are a perfect size to display just about anywhere in your home. These are older wood salvaged corbels or brackets of good quality with a fabulous design. I have never seen this fancy gingerbread design on brackets! They have the original old white paint that is chippy, crackly, with paint loss,with some old dirt and time worn for a great patina. These would be awesome hanging in a doorway, or on a wall. Or, I show have you can hang them together to create an amazing header pediment. Or perfect to just set out. Perfect to add a touch of architectural interest to your shabby chic, Jeanne d'Arc, French country, Farm House style or romantic cottage home. Measurements are about 19 1/2" by 10 1/2" by 3/4" each. They weigh about 3 pounds total. THIS IS AN OLD SALVAGED ARCHITECTURAL POST, BASE FROM AN OLD COLUMN WITH THE ORIGINAL OLD WHITE PAINT. This is an older wood column base in a larger size. These are awesome to use as a display pedestal for a special item, as I show. THIS IS FOR THE BASE ONLY. It has the original white paint except on the bare wood where the original column was. you could put white paint on it, if you wanted to, or leave it as is. It has the little well or round opening at the center. It is chippy, with paint loss, peely paint, old dirt, stains and time worn for a great patina. A perfect way to add a touch of architectural interest to your room. Great in any shabby chic, Victorian, Antique, romantic cottage or French country home. Measurements are from about 10" by 10" by 3 1/2" tall. The top for display is about 8" wide. It weighs about 4 pounds. OMG! THESE ARE INCREDIBLE CORBELS. THESE ARE A PAIR OF OLD WOOD ARCHITECTURAL CORBELS WITH THE ORIGINAL CHIPPY WHITE PAINT AND AWESOME DETAILING. The old architectural pieces like this add an awesome look to any decor. These are a perfect size to display just about anywhere in your home. These are older wood salvaged corbels of good quality with a fabulous design. They have a very ornate design with the little medallions that you rarely see on corbels. They look like they had finials at one time, but those are no longer there, and it was touched up with white paint there. . They have the original old white paint that is chippy, crackly, with paint loss,with some old dirt and time worn for a great patina. Perfect to add a touch of architectural interest to your shabby chic, Jeanne d'Arc, French country, Farm House style or romantic cottage home. I also show how they would look in a doorway or a wall with a grouping underneath. Measurements are about 31" BY 20" by 5" each. Together they weigh 30 pounds. THIS IS AN OLD ARCHITECTURAL SALVAGED PIECE OF AN ANTIQUE VICTORIAN WIDOWS WALK AND ORNATE DETAILS THAT WOULD MAKE AMAZING WALL DECOR. This is so unique with an awesome look. The old antique Victorian pieces of Widows Walk are so hard to find. This one is very ornate with an amazing design. It has the old white paint with paint loss, with color variation, a little rusty, and wear for a great patina. It can be hung either with the finial points up or down as I show. PLEASE NOTE THAT THERE IS A LITTLE BROKEN PIECE ON ONE OF THE SMALLER FINIALS AS I SHOW. This would would be fabulous and add a touch of architectural interest in any shabby chic, Farm House, Jeanne d Arc Living,romantic cottage or French Country home. Measurements are about 22 1/2" long by about 18" tall. It weighs about 17 pounds. THIS IS AN OLD ARCHITECTURAL FRAGMENT FROM A CAPITAL WITH A CHIPPY WHITE PATINA. AND AWESOME DETAILING. The old vintage architectural pieces like this add an awesome look to any decor. This is a nice smaller size. This is an older salvaged piece from an old building with a fabulous design. It is made of heavy composition or heavy plaster It has the original old white paint that is chippy, crackly, flaked paint, with paint loss, with some old dirt and time worn for a great patina. There are some some minor chips. It is not free standing and there are no hangers on the back. It would be fabulous sitting in an old urn, planter, or leaning on a shelf. I LOVE MIXING ARCHITECTURAL SALVAGE TOGETHER IN A GROUP, LIKE I SHOW. SORRY, THE BACKGROUND PIECES ARE NOT FOR SALE. THE URN IS LISTED ON ANOTHER SHABBYTOWNUSA EBAY AUCTION THIS WEEK. Perfect to add a touch of architectural interest to your shabby chic, Jeanne d'Arc, French country, farm house decor or romantic cottage home. Measurements are about 8 1/2" tall by 5 1/4" wide and 3" deep. It weighs about 2 pounds. THIS IS AN AMAZING OLD VINTAGE SALVAGED CAST IRON FENCH POST FINIAL AND A STAND OR BASE WITH A GREAT LOOK. This is an older salvaged fence post from an old farm. It is very shapely with a fabulous flower on top. The bottom was cut, and although it will stand on it's own, it could tip easily, so it has this awesome salvaged base or stand that it fits on easily and looks so awesome together. The post has the original black paint and the stand has the old white paint that are chippy, with paint loss, a little chippy and time worn for an awesome patina. This would add a nice architectural touch to any room of your home. Perfect anywhere in your home in your shabby chic, French country, Farm House, Paris Apt or romantic cottage decor. Measurements are about 18" tall by 10" by 10" at the bottom of the stand when the post is on the stand. The fence post alone is about 16" by 5" by 4". They weigh about 15 pounds together. OMG! THESE ARE AMAZING CORBELS. THESE ARE A PAIR OF OLD WOOD ARCHITECTURAL CORBELS WITH FINIALS, THE ORIGINAL CHIPPY WHITE PAINT AND AWESOME DETAILING. The old architectural pieces like this add an awesome look to any decor. These are statement making corbels in a nice large size. These are older wood salvaged corbels of good quality with a fabulous design. They have fabulous finials at the ends, which is getting so hard to find. They have a very ornate design. They have the original old creamy white paint that is chippy, crackly, with paint loss,with some old dirt and time worn for a great patina. They have the old square nails! PLEASE NOTE~~~the front tips at the end look like they were cut at one time, but are solid. Don't let these get away! Perfect to add a touch of architectural interest to your shabby chic, Jeanne d'Arc, French country, Farm House style or romantic cottage home. Measurements are about 23 3/4" by 21 1/4" by 3 1/4". They weigh 18 pounds total. OMG PAIR LARGE Old Architectural CORBELS ORNATE Chippy White SHAPELY FINIALS The BEST! OMG! THESE ARE INCREDIBLE CORBELS, ONE OF THE BEST PAIR I HAVE SEEN. THESE ARE A PAIR OF OLD WOOD ARCHITECTURAL CORBELS WITH THE ORIGINAL CHIPPY WHITE PAINT AND AWESOME DETAILING. The old architectural pieces like this add an awesome look to any decor. These are a perfect size to display just about anywhere in your home. These are older wood salvaged corbels of good quality with a fabulous design. They have a very ornate design with finials at the ends. Even these finials are ornate and special. They even have little medallions on them. They have the original old white paint that is chippy, crackly, with paint loss,with some old dirt and time worn for a great patina. Perfect to add a touch of architectural interest to your shabby chic, Jeanne d'Arc, French country, Farm House style or romantic cottage home. Measurements are about 31" BY 25" by 5" each. Together they weigh 50 pounds. WHAT A FABULOUOS PIECE OF SALVAGED CEILING TIN WITH THE FACE OF A WOMAN OR ANGEL AND WITH PATINA. This is an old piece of salvaged ceiling tin that came out of an older home. 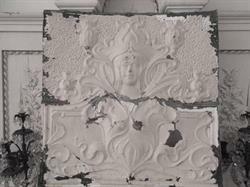 It has an incredible thick formed pattern with a woman, cherub of angel and other ornate details. It has a great design and the original creamy white paint that is chippy with scrapes, paint loss a little rust and wear for a great patina. There are some minor dings, and a couple little cuts on the edges. It is not perfectly flat. There are the old nail holes to hang it from. Measurements are about 24" by 24". It weighs about 2 1/2 pounds. THIS IS INCREDIBLE AND IS AN OLD PIECE OF SALVAGED CEILING TIN WITH A GORGEOUS PATTERN OF FOUR ANGELS OR CHERUBS WITH WINGS AND GARLANDS ALL ACROSS AND WITH THE OLD ORIGINAL PINK PAINT. This salvaged architectural decor piece came off an old ceiling and is about 49" long, and is slightly curved. The pattern is gorgeous with 4 precious cherubs or angels with wings and garlands or swags all across. It has the old brown paint that is a little chippy with minor dirt, paint loss, a little rust and time worn for a nice patina. There are a few minor dings and some old nail holes. The back has some rust. This would be stunning hanging on your wall to add a touch of architectural interest to your room. Perfect anywhere in your home in your shabby chic, French country, Paris Apt or romantic cottage decor. Measurements are about 49" by 13 1/2" tall. It weighs about 3 pounds. THESE ARE A PAIR OF HUGE OLD ARCHITECTURAL CORBELS WITH THE OLD CHIPPY WHITE PAINT AND AWESOME DETAILING. The old architectural pieces like this add an awesome look to any decor. These are statement making corbels and a nice large size of almost 3 feet tall at about 33" by 28" by 5 1/2". These are older wood salvaged corbels with a fabulous design. They were removed from a late 1800's home. They have a very ornate design. They look like they had finials at one time, but they are missing. They have the old white paint some green paint along the ends that is chippy, crackly, with paint loss,with some old dirt and time worn for a great patina. There are some old cracks, and a some minor chips, as I show, but they are solid. The design is wonderful for a great architectural look and what a statement this will make in your home. You rarely see them this large and this ornate. Don't let these get away! If interested in doing a layaway, please email for details. Perfect to add a touch of architectural interest to your shabby chic, Jeanne d'Arc, French country, Farm House style or romantic cottage home. Measurements are about 33" by 28" by 5 1/2" thick each at the widest point. They weigh 25 pounds each. OMG! THESE ARE THE BEST CORBELS I HAVE SEEN IN A LONG TIME. 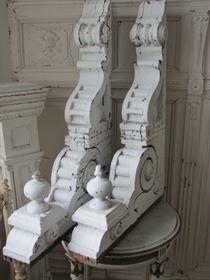 THESE ARE A PAIR OF HUGE OLD ARCHITECTURAL CORBELS WITH THE ORIGINAL CHIPPY WHITE PAINT AND AWESOME DETAILING. The old architectural pieces like this add an awesome look to any decor. These are statement making corbels and a nice large size of almost 3 feet tall at about 33" by 22". These are older wood salvaged corbels of good quality with a fabulous design. They were removed from a late 1800's home. They have a very ornate design. They have the original old white paint that is chippy, crackly, with paint loss,with some old dirt and time worn for a great patina. There are some old cracks, and a some minor chips, as I show, but they are solid. The design is wonderful for a great architectural look and what a statement this will make in your home. You rarely see them this large and this ornate. Don't let these get away! If interested in doing a layaway, please email for details. Perfect to add a touch of architectural interest to your shabby chic, Jeanne d'Arc, French country, Farm House style or romantic cottage home. Measurements are about 33" by 22" by 5 1/2" thick each at the widest point. They weigh 20 pounds each. OMG OLD Salvaged ARCHITECTURAL Chippy CREAMY WHITE CAPITAL Front Very Ornate! THIS IS INCREDIBLE AND IS AN OLD PIECE OF SALVAGED CEILING TIN WITH A GORGEOUS ORNATE PATTERN AND FOUR ANGELS OR CHERUBS WITH WINGS WITH THE OLD ORIGINAL WHITE PAINT. This salvaged architectural decor piece came off an old ceiling and is about 24" by 24". The pattern is gorgeous and so ornate with 4 precious cherubs or angels with wings in the corners. You can hang it square or at an angle. It has the old white paint that is a little chippy with minor dirt, paint loss, and time worn for a nice patina. There are some old nail holes. This would be stunning hanging on your wall to add a touch of architectural interest to your room. Perfect anywhere in your home in your shabby chic, French country, Paris Apt or romantic cottage decor. Measurements are about 24 1/4" by 24 1/4".